Posted by Pam in KC in Stash Busting Report. Last stash report of the year. All in all I’m pleased with my results. I used in excess of 100 yards of fabric. My fabric purchases were kept to a minimum – 94 yards, although I inherited or was gifted another 81 yards. The pincushions above are the results of my last-minute sewing. 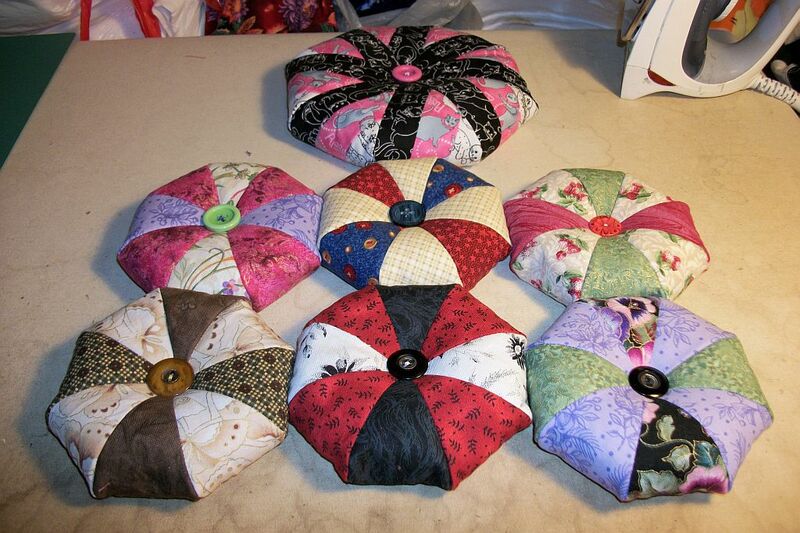 I read about the pincushions on The Cozy Quilter’s blog, which in turn led me to the Moda Bake Shop. The pink, black and white pincushion at the top is HUGE. It really needs some more stuffing. I ended up using 45-degree diamonds cut from 2 1/2 inch strips. They finished at about 4 1/2″ in diameter. I stuffed my pincushions with about 1 1/4 cup of crushed walnut shells. I finished it off with button from my button box. Check out other results by following the links over at Patchwork Times. Cute pincushions…and you did have a good year for stash management! very cute pincushions and great on your numbers. I love those pin cushions.